Did you know that the average American woman spends USD 20,557 on shoes in a life time? It doesn’t look much better when you convert it into AED 75,506. That’s a lot of money! Just guess how many of these shoes are never worn or maybe just once. I know I’ve been guilty of that! What about you? My shoe collection has changed over the years and nowadays includes anything from relaxing flip flops, cool sneakers to comfortable flat and super high heels. Yet, what remained the same over the years: There aren’t too many! Today, we’re helping you to make space in your shoe closet! Let go off those painful shoes! This may be the hardest part. If you are a family of 5, your space is most likely not the same as for a couple. In either case, how much space of your home do you want to give to shoes? Will everybody in your home get the same amount of space? If you have young kids, they may outgrow their shoes so quickly, you only want to keep a few for them. They’d thus not need as much space as two adults have. If you have more space than shoes and still want to declutter your collection, decide on a number of pairs you’d like to keep. This may be more arbitrary. For some, this could be 10 pairs while for others it’s 33. Start by putting all shoes into one place where you can sort through them. If you keep most of your shoes in the hallway, that may be the easiest place. That’s where I keep the ones I wear on a regular basis. Others may have theirs in the bedroom. From a Feng Shui perspective, it impacts your energy fields negatively and you may want to remove them. It’s easy to pick out the pair you wear on a daily basis. What about the others? I remember when looking at a pair, thinking “oh I haven’t worn them for a while, let’s put them on today.” 10 minutes after leaving the house, I remember why! Do you still have both shoes? Do you still wear them? Regularly? Do they still feel good? Are they still in great condition (no holes, excess wear or stains)? Are they still “smell free” (no stinkies)? Do they still match your other clothes? Do they still match your lifestyle? 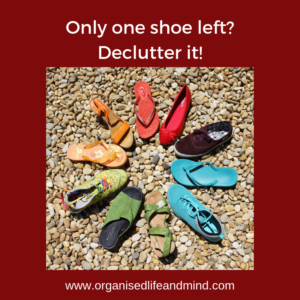 If the answer is “no”, declutter them! These questions will make it easy for you to let go of those that hurt, are too high, too fancy or don’t match your style anymore. You know how much space you have and the questions will have eliminated some pairs already. Yet, you may have spent quite a bit of money on your shoe collection and are reluctant to let go. Or like to wear a lot of different pairs. Keep not just the shoes you love, but also the ones you need, those you wear on a regular basis. If you haven’t worn the pair within the next 3 months, let them go! Match your shoes to your wardrobe. If you have a colourful wardrobe, consider this when going through your shoes. Are you a more classical office lady who likes comfort outside of work? Don’t just keep the sneakers. Donate the ones that are well kept. Bring them to your local charity shop or to a recycling bank. You can also give them to another family member or have a clothes exchange with your friends. If you prefer to make some extra cash, sell them online (e.g. Dubizzle) or at a flea market. Are you uncertain about a particular pair? Wear it! Try to figure out why you’re not sure either way – to keep or to let go. 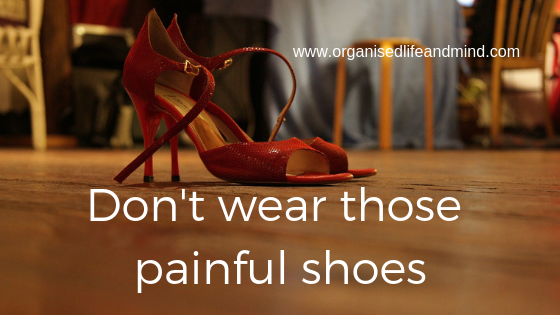 Life is too short to wear painful shoes. If you don’t have enough space for the shoes you want to keep, purge more. Do you really need 12 pairs of similar black shoes? Choose 2-3 comfortable pairs of different heights. 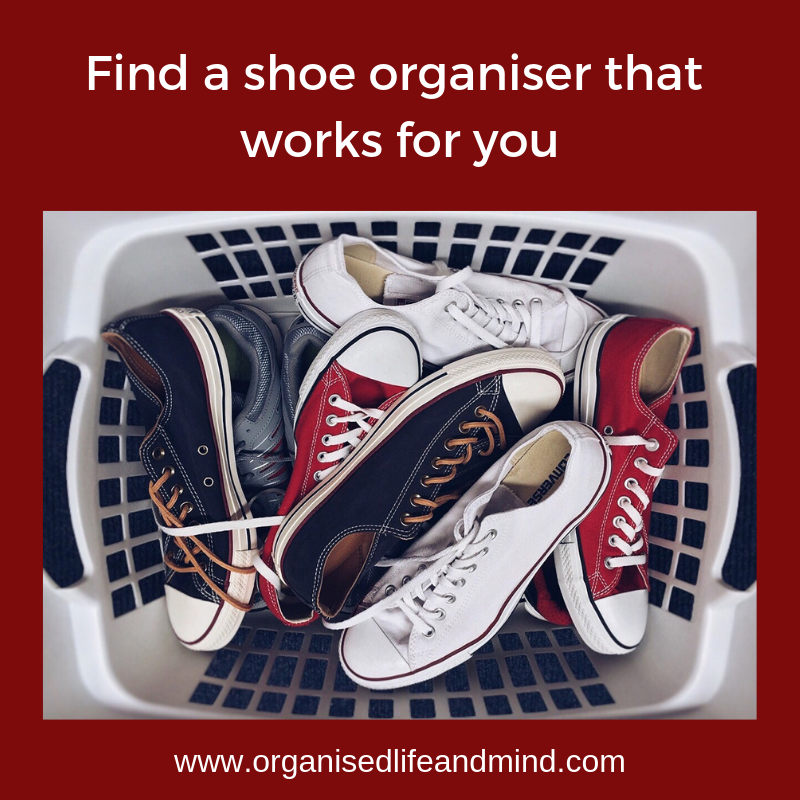 Invest in a shoe organiser. This can be a shoe cabinet which hides your shoes, an open shoe rack that gives you easy access or a few baskets to simply throw them in. Choose what matches your preferred way and keep your shoes there. Store seasonal shoes, which you still wear frequently during that season, outside your regular shoe cabinet to create extra space. Clear containers are perfect for this. They let you see what’s inside while protecting them from dust. As we’re preparing for Christmas and the end of 2018, we’re going through our closet and are busy making space for the new year. Join us and let go off those uncomfortable, stinky shoes this week! Tell us how you got on by leaving us a comment and/or a picture of your shoe decluttering session. Can’t wait to read it!